First up, I apologise for the quality of these photos! I’m still trying to get to hang with my DSLR camera. Although I’ve had it for almost a year, it still confuses me! Today I wanted to share a post on the Muji Acrylic 5 Drawers, which I use to store most of my eye and lip products in. 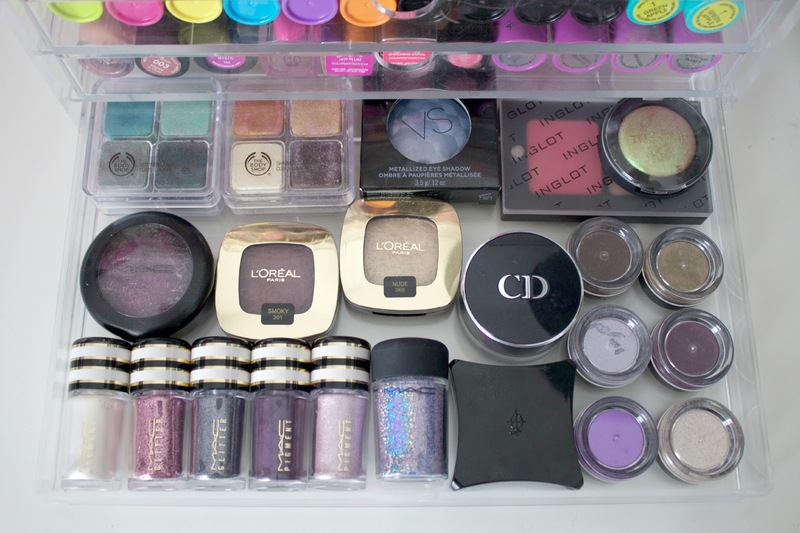 I’ve done a few full makeup collection and storage posts before on my blog (2012, 2013, 2014), and its probably about time I do another full updated post as its changed a lot even since last year! I store most of my makeup in the IKEA Alex 9 Unit and my IKEA Malm Dressing Table with this Muji 5 Drawer on top of my dressing table. 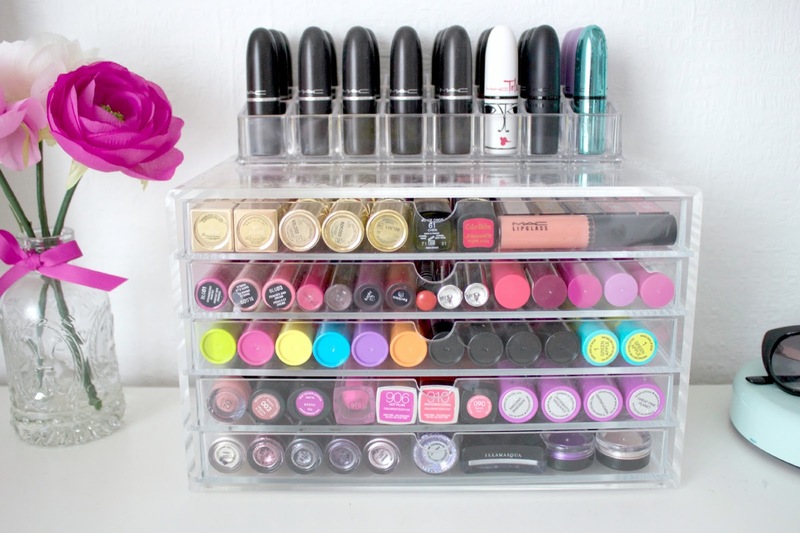 Acrylic makeup storage is very popular, with Muji leading the way. They’ve earnt a very high praising in the beauty community. I like the way you can see the products without having to rummage around, saving time. The drawers also look super cute and I love to have it on display on my dressing table. The Muji Acrylic 5 Drawers (which currently has 10% off!) are the perfect way to store makeup products. The drawers aren’t very deep, so I use them to keep my lip and individual eye products in. They also sell deeper drawers, so you could store larger products in them. I’ve tried a few different acrylic drawers from other companies, but often found the drawers get stuck. I used to have one from Homebase which wouldn’t open, so I literally had to break it to get my products out! Luckily I’ve not had that issue with Muji. 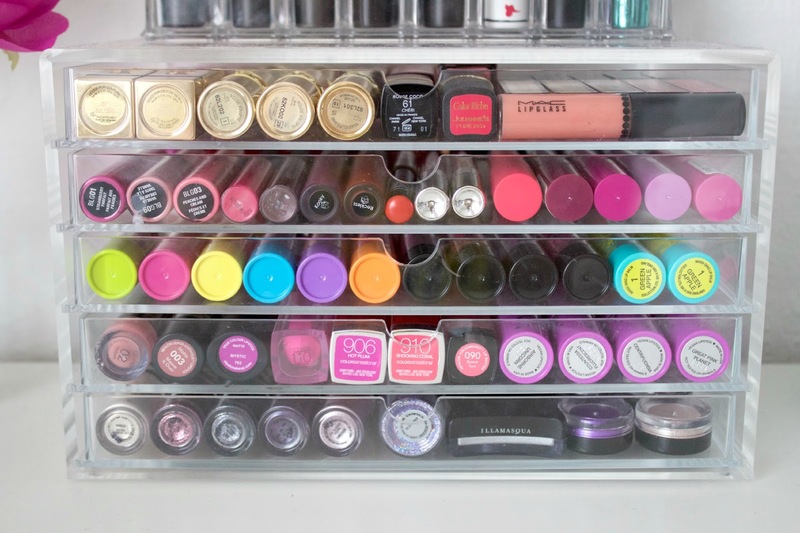 As for my MAC lipsticks, I keep them in an acrylic holder from eBay on top of the Muji drawer. I currently own 24 MAC lipsticks (the addiction is real!) so I like to keep them separate and easy to grab, plus they’d fill the drawers pretty quick. 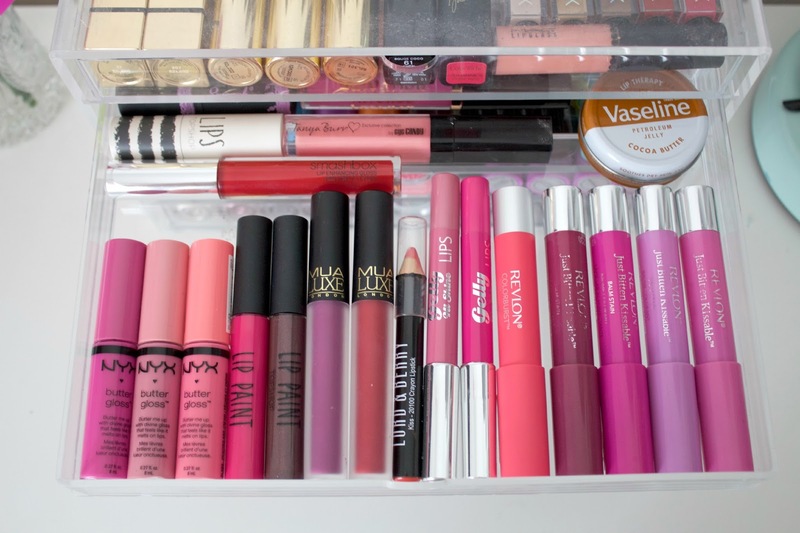 In the first drawer I keep most of my high end lip products, and a few drugstore products that wouldn’t fit in the other drawers. On the top row I’ve got my Benefit Lollibalm and Benebalm, Gerard Cosmetics lipsticks, Bourjois Velvet Lipsticks, a YSL Kiss & Blush and my Ingot Lip Duo. On the bottom row I’ve got all my YSL and Chanel lipsticks and a random L’Oreal lipstick then my Smashbox glosses and a MAC Lipglass. This is my favourite drawer, I love YSL lipsticks- as I’ve said so many times on my blog before! In the second drawer I keep mainly drugstore lip glosses, crayons and balm stains. In the bottom row I’ve got my NYX Butter Glosses, Topshop Lip Paints, MUA Lip Lacquers, Lord & Berry Crayon Lipstick, Barry M Gelly Hi Shine Lips and Revlon Balm Stains. In the back I’ve got a Topshop Lipstick, Tanya Burr Lip Gloss, Smashbox Lip Enhancing Gloss and some Vaseline. 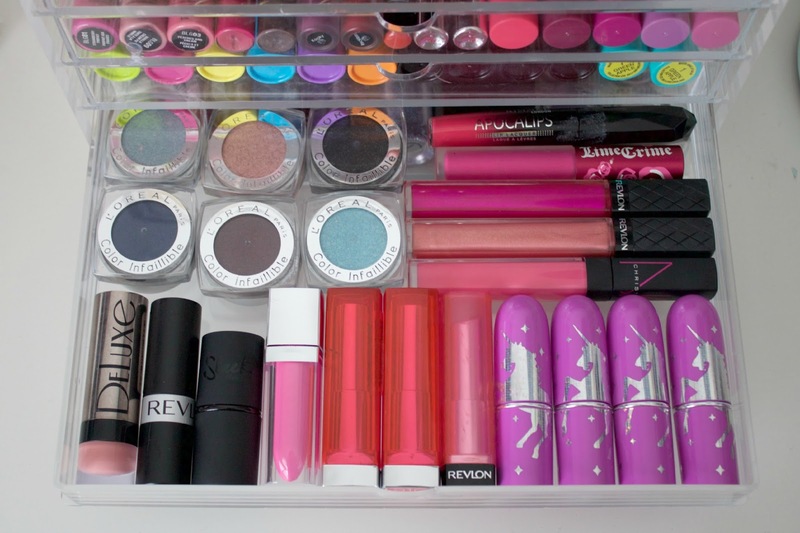 The fourth drawer is a mixture of lip and eye products. As for lipsticks I’ve got my Collection, Revlon and sleek lipsticks, a Maybelline Colorsensational Elixir, two Maybelline Color Sensational Vivids lipsticks, a Revlon Lip Butter and my Lime Crime Lipsticks. I then have my Nars Christopher Kane Lip Gloss, a couple of Revlon lip glosses, Lime Crime Pink Velvet and a Rimmel Apocalips. In the back I’ve got my L’Oreal Color Infallible eyeshadows. (Please note: I don’t support/purchase Lime Crime products anymore, I just don’t want to waste what I have so once I’ve used them up I won’t repurchase. If you want to find out more I’m sure you can Google the Lime Crime scandal). a random Victoria’s Secret Metallized Shadow, my Inglot Duo and a Topshop shadow. I really love this drawer set, when people come into my room they often pick it out and say it looks nice, then tell me I have a crazy amount of lip proucts! Now I’ve filled this one up, I’ll eventually get a second set to store more lip products in as my collection continues to grow. Muji did a great job with their acrylic storage!